The scalpel can be invaluable in corn and callus debridement. Our stainless steel sterile surgical blades are packaged in a foil pouch with a unique inner liner for maximum protection of both blade and user. 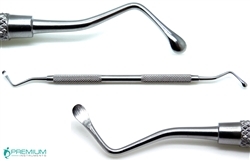 Fine Surgical Instruments, Inc. offers a wide selection of surgical blades, handles, and disposable scalpels. Our commitment to product quality ensures you the superior value you deserve. Professional Nail Scissors Instrument Tray Instrument Set "C" Instrument Set "B"